PHMSA already collects some of this information through its existing NPMS and annual reporting requirements; however, the new proposal would expand the type of information collected and require its submittal in a geospatial format linked to specific pipeline segments. These changes will allow PHMSA to gather far more granular information about the characteristics of pipeline systems and particular segments. PHMSA states that collection of this additional information will allow for better-informed first responders; strengthen PHMSA’s ability to analyze operator programs; allow PHMSA to make better, risk-based decisions in the context of inspections and rulemaking; and feed into “important risk-ranking algorithms” used by PHMSA. Given the breadth and detail of the information PHMSA proposes to require of operators, it is notable that the initiative takes the form of an OMB information collection rather than a proposed regulation. PHMSA’s proposed changes can be found in greater detail in an updated draft of the NPMS Operator Standards Manual. On July 25, the Environmental Protection Agency’s (EPA) Office of Inspector General issued a report, “Improvements Needed in EPA Efforts to Address Methane Emissions From Natural Gas Distribution Pipelines,” finding that EPA’s efforts to address methane emissions from gas distribution pipelines need improvement. The Report recommends that, as part of the Administration’s 2013 Climate Action Plan and 2014 Interagency Methane Strategy, EPA work with PHMSA to address methane leaks from a safety and environmental perspective and develop a strategy to address financial and policy barriers that limit emission reductions in the distribution sector. The report also recommends that EPA establish performance goals, track progress in reducing emissions from distribution pipelines, and gather data to determine if future regulation is appropriate. More information on the Administration’s 2014 Interagency Methane Strategy is here. On July 29, the White House and Department of Energy (DOE) announced a number of new initiatives to reduce methane emissions from natural gas systems. The new initiatives include (1) establishing energy efficiency standards for new natural gas compressors; (2) recommending that the Federal Energy Regulatory Commission explore options to increase cost recovery certainty for new investment to modernize natural gas transmission infrastructure; (3) working with industry to establish an Advanced Natural Gas System Manufacturing Research and Development Initiative; and (4) partnering with the National Association of State Regulatory Utility Commissioners to accelerate investment in infrastructure modernization and repairs to natural gas distribution facilities. DOE’s fact sheet is here. PHMSA to convene webinar on gas Distribution Integrity Management Programs. On September 4, PHMSA will host a webinar on gas distribution integrity management programs (DIMP). Regulators will share their experiences implementing DIMP and discuss the mechanical fitting failure reporting data and analyses. Operators will share lessons learned and the National Association of Pipeline Safety Representatives (NAPSR) and PHMSA will provide a report from the Plastic Pipe Ad Hoc Committee. Written comments may be submitted before, during, or after the webinar. Register for the meeting here. PHMSA 2015 One Call Grant: This grant supports initiatives that promote damage prevention efforts, including one-call legislation, related compliance activities, training and public education. The grant is limited to $45,000 per state annually and is open only to states authorized by PHMSA to perform pipeline safety inspections. Applications are due September 23. PHMSA 2015 Hazardous Liquid and Gas Base Grants: PHMSA is accepting applications for grants to fund state hazardous liquid and gas pipeline safety program costs. The grants may reimburse a state agency up to 80 percent of the actual costs of carrying out its pipeline safety programs, including the cost of personnel and equipment. Hazardous liquids Applications and gas Applications are due September 30. Presentations from Pipeline Safety Management System Workshop are available. Presentations from PHMSA’s February 27 workshop on a safety management system national consensus standard are available. PHMSA Rulemakings. The table below reflects information on the status of PHMSA rulemakings as reported in the Department of Transportation’s (DOT) July Significant Rulemaking Report. Additional information from the Office of Management and Budget’s (OMB) Office of Information and Regulatory Affairs (OIRA) is here. New information in the table is reflected in bold. New Criminal Charges Filed Against PG&E. On July 30, the United States filed a superseding indictment against the Pacific Gas & Electric Company (PG&E) for alleged criminal violations resulting from a September 2010 natural gas transmission line incident in San Bruno, California. The superseding indictment alleges that PG&E obstructed the National Transportation Safety Board’s investigation of the accident and committed 27 knowing and willful violation of the Pipeline Safety Act. According to a press release issued by the U.S. Attorney’s Office for the Northern District of California, the maximum penalty for each count alleged in the indictment is a $500,000 fine, or a fine based on the twice the gross gain PG&E made as a result of the violations ($281 million) or twice the losses suffered by the victims ($565 million). Tesoro files complaint challenging county ordinances affecting hazardous liquids pipelines. On July 23, Tesoro Refining and Marketing Co. filed a complaint in federal district court in Utah alleging that three ordinances enacted by Summit County, Utah, are preempted by federal law, including the Pipeline Safety Act. 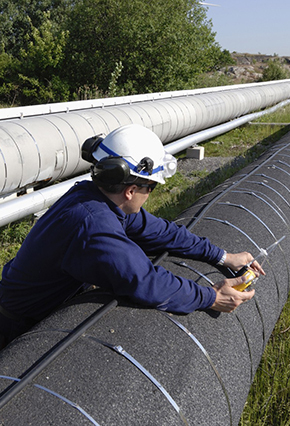 The ordinances establish permitting procedures and requirements for hazardous liquid pipelines, including design approval requirements, design and construction criteria, maintenance, repair, and marking requirements, and emergency preparedness plans. The ordinances also include restrictions on placement of hazardous liquid transmission pipelines. The Interstate Natural Gas Association of America (INGAA) announces initiative to reduce methane emissions. On July 29, INGAA announced that it will develop industry guidelines for Directed Inspection and Maintenance, a tool for detecting and mitigating leaks. INGAA plans to work with research groups to create a roadmap for developing technological innovations. BlueGreen Alliance releases report on benefits of repairing and replacing gas pipelines. On July 23, the BlueGreen Alliance released a report entitled “Interconnected – The Economic and Climate Change Benefits of Accelerating Repair and Replacement of America’s Natural Gas Distribution Pipelines.” The report finds that accelerating the timeframe of replacing pipe will increase the Gross Domestic Product, create jobs, result in gas savings, and reduce methane emissions. *California Public Utilities Commission adopts agency-wide safety policy statement. On July 10, the California Public Utilities Commission (CPUC) adopted a safety policy statement focused on achieving a goal of zero accidents and injuries across all the CPUC-regulated utilities and businesses. The CPUC is committed to the following principles: (1) continually assess and reduce the safety risk posed by the companies it regulates; (2) hold companies (and their contractors) accountable for safety; (3) be accountable for the oversight of safety in the industries it regulates; (4) provide clear guidance on expectations for safety management and outcomes; (5) provide transparent and effective procedures to enforce those expectations; (6) promote reliable access to utility services that support health and safety; (7) promote a culture of safety vigilance by CPUC staff and in the industries it regulates; and (8) learn from experience and continuously improve safety oversight and outcomes. The CPUC staff is directed to design, within 180 days, an ongoing safety management system and to prepare a work plan towards meeting the core safety goal. AB 1937 (Gordon): This bill would amend the California Public Utilities Code to require gas corporations to provide at least three working days’ notice before undertaking any non-emergency excavation or construction activity within 500 feet of a school or hospital. The bill passed the Assembly by unanimous vote on May 23, and was referred to the Senate for consideration. The Senate amended the bill on June 11 to include a 5-year recordkeeping requirement and a provision requiring excavators or operators to comply with the state’s one-call notification requirements. On June 30, 2014, the Senate amended the bill to delete a recently added provision regarding excavator or operator compliance with the one-call requirements. SB 1371 (Leno): This bill would require the CPUC to adopt rules and procedures governing natural gas leakage abatement for regulated intrastate transmission and distribution lines in order to reduce emissions of natural gas. The regulatory proceeding would commence by January 15, 2015, and the rules and procedures would be required to meet the following objectives: (a) provide for the maximum technologically feasible and cost-effective avoidance, reduction, and repair of leaks and leaking components within a reasonable time after discovery; (b) provide for the ranking or recorded leaks and leaking components by volume or energy content; (c) evaluate natural gas leakage abatement practices to determine effectiveness; and (d) establish and require the use of best practices for leak surveys, patrols, leak survey technology, leak prevention, and leak reduction. The Senate passed the bill in late May and referred it to the Assembly for consideration. On July 1, 2014, the Assembly amended the bill, in part, to clarify that the CPUC’s rulemaking is to give priority to safety, reliability, and affordability of service and to clarify that, unless expressly stated, the bill does not alter the CPUC’s jurisdiction over greenhouse gas emission regulation. H 4164: The bill would incorporate into Massachusetts law the federal limitations on the amount of administrative civil penalties for pipeline safety violations. The bill would also: (a) establish uniform natural gas leak classifications for all gas companies; (b) require written notification to a gas company of a significant project on a public way that will expose natural gas infrastructure; (c) require the gas company to ensure that any shut off valve in the project area has a gate box installed or a reasonable alternative that would ensure public safety and that any critical valve is operational and accessible; (d) prioritize pipeline repairs for gas leaks detected in a school zone; (e) require annual reporting of gas leaks and repairs; (f) authorize implementation of a targeted infrastructure replacement program; (g) require operators to give notice of “incidents” at the earliest practicable moment following discovery; and (h) require that consideration be given to creating new standards for performing winter surveillance and patrols of cast iron pipe. The Massachusetts legislature enacted the bill on June 16, and the governor signed it on June 26. The Michigan Public Service Commission proposes to incorporate federal safety regulations. On July 1, the Michigan Public Service Commission announced a public hearing on proposed amended rules that adopt by reference the current federal gas safety standards as set forth in 49 CFR parts 191, 192, and 199. In addition, the proposed rules would adopt updated technical standards and include a provision that clarifies the disconnection or abandonment of indoor gas facilities. The public hearing was held on July 17. HB 1867 (Schatz): This bill proposes numerous changes to Missouri’s damage prevention statute, including altering the definitions of “excavation” and a “pipeline facility” and adjusting the requirements for marking underground facilities. It also sets the failure to notify by an excavator and the failure to mark facilities by an owner or operator as a rebuttable presumption of negligence. The bill was approved by the Governor on June 30. *Proposed Regulation Incorporating Federal Requirements. The Nebraska State Fire Marshal has proposed regulations updating the Nebraska Administrative Code to include current federal pipeline safety standards and setting forth requirements for a statewide One-Call Notification Center. The proposed revisions were approved by the Governor on July 28 and are effective Aug. 2. *HB 1224 (Baber): Recently signed into law by Governor Hassan, this legislation requires the public utilities commission to apply annually to PHMSA for authorization to conduct pipeline inspections and incorporates the federal civil penalty limits set forth in the Pipeline Safety Act for violations of any standards or rules affecting gas pipelines and liquefied petroleum gas systems. HB 1376 (Hammon): The bill would establish a committee to study the safe delivery of oil and gas, including natural gas and propane, throughout the state of New Hampshire. The committee would be required to report its findings and any recommendations for proposed legislation by May 1, 2015. The bill would also make a technical correction regarding the submission of oil pipeline facility spill response plans. On June 4, the Conference Committee Report was adopted. The bill was enrolled on June 18 and is expected to be delivered to the Governor. A 9336 (Rodriguez/ S 7010 (Espaillat): These companion bills would require operators of gas distribution facilities to accelerate the repair or replacement of pipe segments that are leaking, are at “high risk of leaking,” or may no longer be fit for service due to inferior materials, poor construction methods, lack of maintenance, or age. The bills also would provide a cost recovery mechanism for the accelerated repair or replacement program. Both bills have been referred to the respective energy committees. HB 2533 (Watson): This bill designates the Oklahoma Corporation Commission as the agency responsible for enforcing the Oklahoma Underground Facilities Damage Prevention Act. It also sets forth the requirements for a Notice of Inquiry process to evaluate the state’s pipeline safety programs, including addressing any findings or recommendations contained in the final report of the Pipeline Safety Task Force convened by Gov. Mary Fallin. The bill was approved by the governor on May 9. HB 1607 (Baker): The bill would amend Pennsylvania’s Underground Utility Line Protection Law (also known as the PA One Call Law) and extend the sunset date of the Act through 2021. In general, the bill would transfer enforcement authority from the Department of Labor and Industry to the Pennsylvania Public Utility Commission; create a Damage Prevention Committee; place additional duties upon facility owners, excavators and project owners; and create an administrative process for the determination of violations and the assessment of penalties. On June 27, the House passed the bill, and it has been referred to the Senate Consumer Protection and Professional Licensure Committee. Washington proposes civil penalty cap increase. In May, the Washington Utilities and Transportation Commission (WUTC) proposed amending its gas pipeline safety rules for intrastate facilities to increase the maximum civil penalties for pipeline safety violations. The proposed amendment would increase the maximum per-violation penalty from $100,000 to $200,000 per violation, and the maximum penalty for a related series of violations from $1,000,000 to $2,000,000. The amendment would make the state penalty caps consistent with federal limitations in the Pipeline Safety Act. The WUTC convened a hearing on the proposed amendment on July 2 in Olympia. More information is here.